Happy Father's Day beauties! Hope everyone is having a fabulous day! I thought i would finally share my favorite Lush products of all time. I might be one of the few people that has tried almost all of Lush's one of a kind products. After trying product after product, I've came up with a list of my absolute favorites. A couple didn't make the list but I wanted to keep it short and sweet. You might notice in my picture there are only 4 items shown. That is because 1 of my favorite products only come out during the holiday so I don't have an actual thing on hand. Why oh why does Lush tortue me by making me wait till the holidays for my favorite shower gel? This has taught me that next time they are released I will stock up big time . One of my favorites has also been discontinued. (It's actually my absolute FAVORITE Lush must have!) SO bummed that I can't buy it anymore. I'm reduced to buying it on Ebay and hoping it's not a fake. Super upsetting. But you never know, Lush is known to surprise every now and then. Candy Fluff Dusting Powder: If Lush can do one scent right, I would say it is the smell of candy, which you will learn from reading this post. Candy Fluff Dusting Powder is one of my favorites for many different reasons. For those of you who haven't tried dusting powder before, let me tell you, it's fabulous. It's a powder that softens your skin, leaves your body shining with glitter and sparkle, and also smells delicious. I think of it as a powder perfume. It lasts so much longer then you would expect, and comes in a cute little tin with holes on top so you don't lose product. You can even put it in your hair for a bit of shimmer. I have many Lush Dusting Powders, but candy fluff is like salt and pepper cotton candy. Yum. And combined with my favorite Lush Perfume.. (keep reading) it's the perfect combination. Lush Dirty Body Spray: Oh how I describe a spray like Lush's Dirty Body Spray? Imagine a Mint Perfume that smells squeaky clean. The perfect "clean" smell. I love this for right after the gym when I'm sweaty and gross. Spray a bit of Dirty Body Spray and you will smell like a refreshing stick of gum. I always feel super UN dirty, like I just stepped out of the shower. That's why I think it's a bit funny that this is called DIRTY body spray . Men can use it too, in fact my boyfriend has been known to spray it a few times after working in the yard. I literally use this all day long, for all occasions. The only time I'm not using it is when I'm going out and I opt for a feminine smell. But for all day normal routines, Dirty is perfect. It is available now for $19.95 on Lush's site. Lush American Cream is my newest product I added to my collection. When it comes to Lush's Gorilla Perfumes, some can be a bit overpowering and a little too strong for my taste. American Cream is my boyfriend's favorite smell on me. Although it does resemble the gorilla scent a bit, it smells just like the name describes. Like whipped cream with a hint of vanilla and lavender. My only complaint is that it doesn't last as long as I wish it could. It doesn't linger like dusting powder. I'm hoping this particular scent will eventually come out in a solid perfume or powder because I will be the first in line to purchase. . I just found out this was originally put out as a hair conditioner. That's next on my list because this smell is contagious and I'm addicted. I would love for my hair to smell like this. There really is no other smell quite like it, something I can honestly say is true for all my favorite Lush products. I hope this is a permanent product on the LUSH site. If you plan on buying this, don't go looking for it in the store, it only sells online, like many of Lush's products. It sells for $39.95 for one fluid ounce. I'm also hoping Lush will put out a bigger bottle, since I'm almost out! 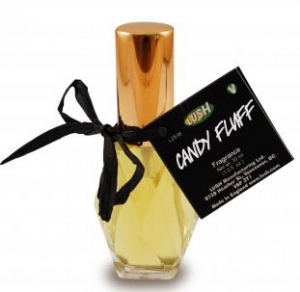 Lush Candy Fluff is my number one must have from Lush. And sadly it is no longer around. I was debating if I should even include this in my favorites, but I love it so much I couldn't resist. It is truley candy in a bottle. I only use this on special occasions, and every time I do people keep asking and asking , "What is that yummy smell and where can I get it?" I'm thinking about writing Lush a letter, begging them to bring it back to me. There is a good amount of this selling on Ebay, but you always have to question if it's real or fake. I will keep you all updated if I see it pop up on any of the Lush sites. 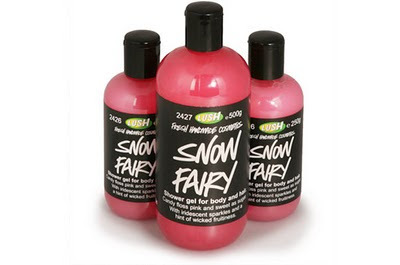 Lush's Snow Fairy only comes out during the holiday, and I'm pretty upset I didn't stock up on this when I had the chance. Flossy Candy greatness in a bottle with huge chunks of glitter in a bright pink gel. Will leave your skin smelling like a candy bar. Are you noticing a trend with my favorite Lush products? Yes I like the smell of candy. And if you do too, Snow Fairy is another hit. I don't know anyone that doesn't like this shower gel. It really should sell all year round. It should come back in November and I can't wait. I will have to buy at least 5 of these so I don't run low. There are many other products that could have made the list, but I wanted to keep it simple. Unfortunately many of my favorites aren't always year round so I know when they come up I have to grab them quick. LushUSA is the website, so keep checking for new candy products!! I know I will be!! I absolutely love Lush everything! My favorite is the Magnaminty Face Mask, I couldn't believe how refreshing it was when I first used it, and now it's a staple in my routine! I've been wanting to buy the Dirty Body Spray, thanks for reviewing it -- I'm def gonna buy it this week! P.S. Thanks for the follow, I'm following your blog as well and am looking forward to more great posts!